The term ‘minimalism’ can mean different things to different people, depending on individual perception, observation, and experience. For some, it’s an entire lifestyle of living with less to alleviate stress, live frugally, and focus on more important values than possessions. For others, it might mean a particular style applied to their interior decorating strategy in order to make the most of a small space. Both of these groups view minimalism as something to be desired, but there are others yet whose misperception of minimalism turns them off to the idea of incorporating it into their decorating habits or general lifestyle. While you’re free to think whatever you like about minimalism, at least be sure you’re not falling for one of these three most common misperceptions of minimalism. Neutral colors, straight lines, scarce decorations, no flair…how boring. This is what I used to think of minimalism. Where’s the creativity, the color, the interest, the things that make me go ‘ooh’ and ‘aah’ when I visit the home décor section at the department store? It took me until very recently to realize that, when it’s done right, minimalism is not boring. It’s just a different mentality. Instead of a room screaming “look at me, I’m interesting!” when you enter it, there are subtle yet very noteworthy details that, once noticed, can be quite intriguing. Have you ever flipped through a home decorating magazine and noticed a living room setting that was otherwise plain-jane, but featured unusual accents, such as handcrafted pieces, or unconventional materials? Since the furniture in a minimalism-inspired room is generally ‘boring’, experts spice things up with variations in texture and unique vintage or up-cycled items you can’t find anywhere else. In my book, that’s the opposite of boring! Another common misperception is that minimal decorating is just a fancy term for not caring about your surroundings. College students, singles (particularly bachelors), and non-creative types, in particular, might not care about décor or put forth much effort, but this isn’t minimal decorating – it’s the absence of decorating. The difference is that minimalism is intentional, whereas a lack of decorating has no intention. People who approach decorating with a minimal perspective will carefully decide what goes and what stays in a room, and may have to purge items that don’t promote the impression or theme they’re going for. If a minimal decorator lives in a small apartment or house, there will be pressure to eliminate even more items due to limited space. This all takes careful thought, so that the end result is the product of potentially hours of rearranging, taking away, adding, and tweaking a room to get just the right feel. That being said, some people come by minimalism naturally, just like any other ability, whereas others (especially former hoarders) will have to work harder at it. If someone can nonchalantly throw a few pieces of furniture and art in a room and make it look like they hired an interior decorator, good for them, but that’s not the norm. The warm in minimal décor will always be subtle, but should also be unmistakably inviting. The cold, stark version of minimalism you see in professional settings may exist, but it isn’t the only or best version of minimalism when it comes to decorating your home. 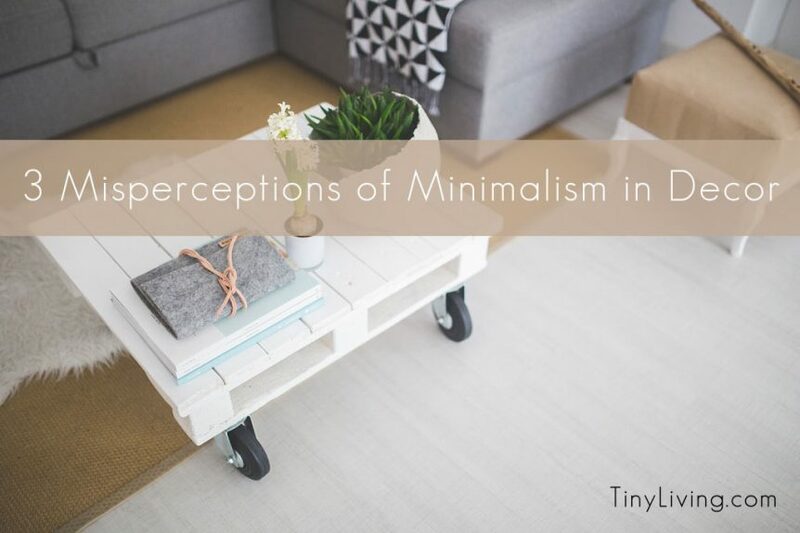 Acknowledging that these are misperceptions about minimalism may help you eliminate the excuses and consider using a minimalist approach to your small space décor. In my experience, minimalism is a great way to achieve a sophisticated, clean-looking style that maximizes the benefits of living in a small home.